Hideki Matsuyama watches his shot Saturday in the third round of the Masters at Augusta National Golf Club in Augusta, Georgia. 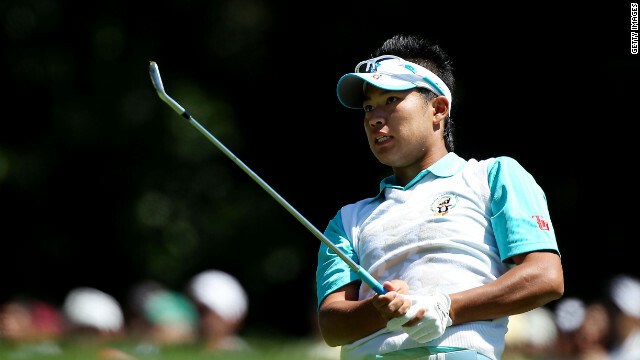 Japanese amateur Hideki Matsuyama loves playing the Masters. Last year, the college student won the Silver Cup, given to the lowest-scoring amateur at Augusta. This year, Matsuyama shot an even par 72 on Saturday, leaving him at one over par for 54 holes and giving him a six-stroke lead over his nearest competitor among the three amateurs who made the 36-hole cut. He’s also the only Japanese player left at Augusta. Ryo Ishikawa, the biggest name in Japanese golf, missed the cut. Asked after his round Saturday if he’s starting to become as well-known in his home country as Ishikawa, the 20-year-old deferred. Those people decided with their feet Saturday as dozens of Japanese patrons and a large media contingent followed Matsuyama for 18 holes. Kazuki Suzuki, of Yokohama, Japan, said he flew to Augusta just to watch Matsuyama. Nobuko Tabata, a Japanese student living in Chicago, came to the Masters with her sisters and parents, who also flew in from Japan, to see Matsuyama. Akinori Yokosawa, a Japanese native now living in Atlanta, said Matsuyama deserves the following, though as yet he doesn’t match Ishikawa’s star power back home. “Ryo is cute, but as a golfer I think (Matsuyama) is better,” he said. Earlier in the week, Matsuyama said he hoped success at Augusta this year would mean something back home, too. He attends school in the Sendai area of Japan, which was devastated by an earthquake and tsunami more than a year ago. “What I would like to do is do my best and play well so that I can encourage them through my play,” he said. Saturday afternoon, he seemed well on his way to both goals: a second Silver Cup and something for his fans back home to cheer about. Malawi declared 10 days of national mourning Saturday following the death of President Bingu wa Mutharika as citizens of the southern African country awaited word on who will succeed him. State-run media confirmed the president's death two days after he succumbed to a heart attack. The delay in a formal announcement sparked chaotic politics and fears of a constitutional crisis. More than 100 soldiers are trapped after an avalanche in the Siachen glacier, a Pakistani military official said Saturday. Rescue operations are under way, and no deaths have been confirmed, said Maj. Gen. Athar Abbas. Heidi Klum has formally filed for divorce from singer Seal, almost three months after they separated, the supermodel's publicist said. Her filing in Los Angeles on Friday marks an end to a romance that captivated the nation with its numerous displays of affection, including a vow renewal ceremony every year and a Halloween costume party that featured Hollywood stars. The two separated in January after seven years of marriage. "While we have enjoyed seven very loving, loyal and happy years of marriage, after much soul-searching we have decided to separate," they said in a joint statement at the time. As outrage over the shooting death of 17-year-old Trayvon Martin continues to grip the nation, key questions remain unanswered over what happened the night of February 26 as conflicting accounts are given by witnesses and attorneys for both sides. What is known is that Martin, wearing a hoodie, ventured out from his father's fiancee's home in Sanford, Florida, to get a snack at a nearby convenience store. As he trekked back to the home with a bag of Skittles and an Arizona iced tea, he was shot and killed by George Zimmerman, a 28-year-old neighborhood watch volunteer. Martin was unarmed. Zimmerman has said he acted in self-defense. A recording of a 911 call made the night of the shooting captured someone pleading for help. Zimmerman has said he was yelling for help, according to his family members and his account to authorities. Martin's relatives have said they are certain the voice heard on the 911 call is Martin's. "From the very beginning and I still do feel that it was the young boy," the witness, who wants to remain anonymous, told CNN Friday. Zimmerman's attorneys jumped on the witness' characterization of Martin as "the young boy." "The pictures you've put up tonight show a 6 foot 3 boy who was 17 years old," Hal Uhrig said, pointing out that teenage boys can have voices that range from high to as low as a grown man. Filed under: Crime • Trayvon Martin • U.S. This blog – This Just In – will no longer be updated. Looking for the freshest news from CNN? Go to our ever-popular CNN.com homepage on your desktop or your mobile device, and join the party at @cnnbrk, the world's most-followed account for news. Overheard on CNN.com: Listen to your dog, the doctor!